Warrior Sailors competed in the Ugotta Regatta hosted by the Little Traverse Yacht Club at Harbor Springs, MI on July 27-30. They also shared their knowledge with youth sailors for a training day with both boats, before competing in the 15 mile pursuit race surrounding the quaint town of Harbor Springs. They were sailing on Warrior 53, alongside Wizard, which are both part of the USMMA boat donation program and used in maritime education and training. Sailing Foundation donor, Peter Askew told Sailing Scuttlebutt Sailing News the full importance in welcoming junior sailors in a full article. 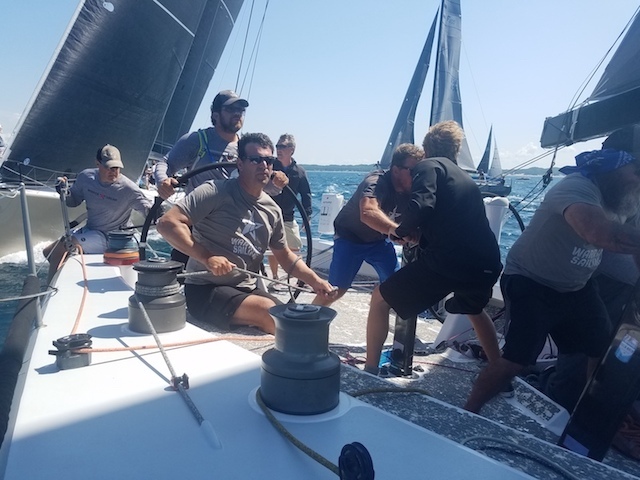 “Warrior Sailing is an incredible program that does a tremendous amount of good and we are honored to compete with and against them,” David Askew (also a Sailing Foundation Donor) said. “Our hope is to help expose Warrior Sailing to all participants of this weekend’s activities.” Warrior Dan Dewent said, “we are thrilled to have the opportunity to participate and learn all that we can!” Read the full article here.